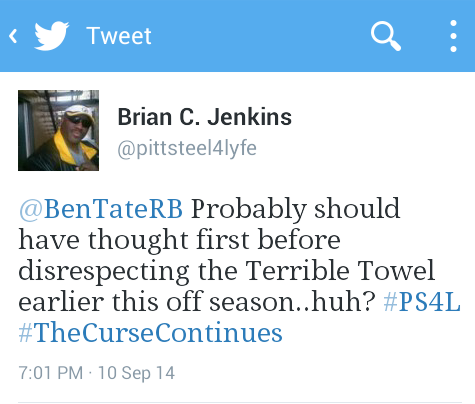 TERRIBLE TOWEL CURSE: Sends Tate Packing | "IT'S A STEELERS WORLD"! 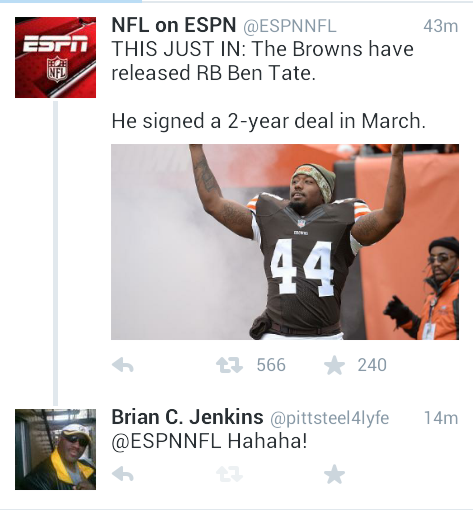 Do any of you remember this tweet above that I sent to Cleveland Browns running back, Ben Tate back in September? Well, as it turns out the injury he suffered in week one against the Pittsburgh Steelers wasn’t enough for “The Curse of the Terrible Towel”! Now, former Cleveland Browns running back, Benjamin Tate has be released by the team this morning after signing a 2 year deal back in March. Which honestly makes me sit and ponder..”DO THESE IDIOTS REALLY UNDERSTAND THE POWERS THAT BE SHOULD NOT BE TAMPERED WITH”? Obviously not, but maybe someday they will. Trust is..I really hope that they don’t. Because if players and/or fans of teams stopped disrespecting Myron Cope’s creation, I would not be able to write about it, giggle hysterically and do the “I Toldyaso” dance. It’s true. While responding to this tweet above from @ESPNNFL (not @ESPN because they blocked me for some strange reason)..I was doing my best rendition of the Running Man. And desperately hope that my “Hahaha” draws the attention of Tate and his fans once again.